Now a days, I have made it a point to try out different cuisines. In India we have different ways to make a particular food item - Tamilnadu style, Andhra style, kerela style etc. But whenever we think of roti or anything tandoori the first thing that comes to your mind is Northern part of India. They love to make different kinds of rotis and they all taste scrumptious. So I thought why not a Rajasthani style for preparing Roti? So here it comes- the 'Missi Roti'. 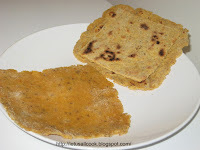 Missi Roti is traditionally made with a combination of whole wheat flour (gehun ka atta) and chickpea flour (besan). In a Bowl mix the wheat flour and besan together. Add oil/ghee, salt, red chilly powder, coriander powder, cumin seeds, kala jeera and ajwain. Mix well. Add warm water and make the dough. Roll into small balls and make it into a round shape using the roller. Put these rotis in the hot tawa and cook them on both the sides. Brush missi roti slightly with melted ghee. Serve hot. Since it is a rakasthani food, it goes well with rajasthani side dish. However, we can eat it with Raita, Pickle or any other gravy we love. This Missi Roti is very easy and will take 10 to 15mts to prepare. looks yummy..i made them too..posted in my blog..